How we love our furry family members! We want to do everything we can to ensure they are happy and healthy. As a fellow fur-parent, we understand that you only want the best food to satiate your dog's appetite and nourish him to his prime vigor. Unfortunately, these are tough times and no matter how badly we wish for high-end dog food, sometimes our budget just won't allow it. Now, finding the best cheap dog food can be a challenge especially when there are so many brands misleading people for the sake of profit instead of our furry companions' welfare. A majority of cheap dog foods consist a high percentage of indigestible bulking agents instead of wholesome ingredients. But don't be discouraged! There are also high-quality healthy dog foods that are also budget-friendly, and we made all the research for you so you won't have to undergo the guesswork. Hence, we came up with a list of the seven best cheap dog foods. By cheap, we don't mean poor quality. We mean high-quality dog food at the right price! 1. 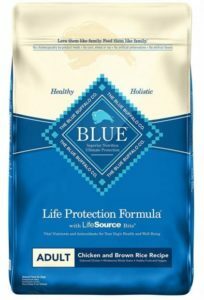 Blue Buffalo Life Protection - Adult Dry Dog Food (Chicken & Brown Rice), $1.33/lb. 2. 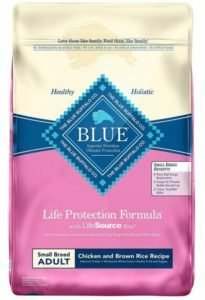 Blue Buffalo Life Protection – Adult Small Breed Dry Dog Food (Chicken & Brown Rice), $1.93/lb. 3. 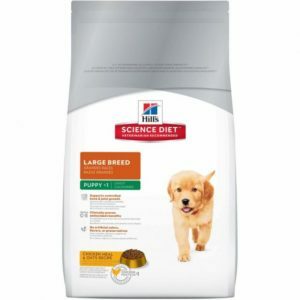 Hill's Science Diet - Large Breed Puppy Dry Dog Food (Chicken Meal & Oats), $1.46/lb. 4. 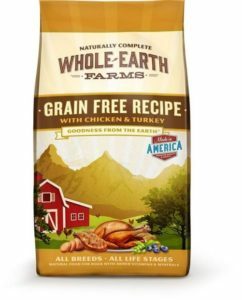 Whole Earth Farms Grain-Free Recipe Dry Dog Food (Chicken & Turkey), $1.59/lb. 5. 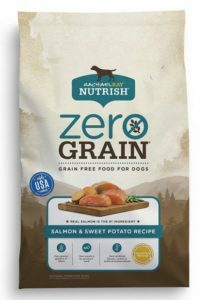 Rachael Ray Nutrish Zero Grain Natural Dry Dog Food (Salmon & Sweet Potatoes), $1.82/lb. 6. 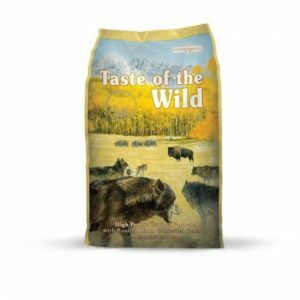 Taste of the Wild High Prairie Adult Dog Food (Venison & Bison), $1.63/lb. 7. 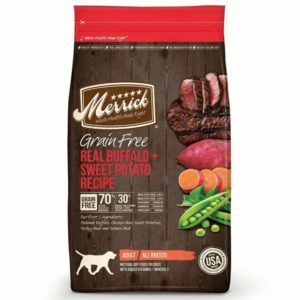 Merrick Grain-Free Dry Dog Food (Buffalo & Sweet Potatoes), $2.39/lb. Real Meat – Walk away from brands that use plant sources for protein instead of real meat. True, legumes provide nourishment but their protein content is insufficient for our canine buddies' needs. Manufacturers use peas and corn as a cheap way to bulk up food. Some dogs find it difficult to digest pea protein, causing them stomach aches, indigestion, and other digestive problems. Meat protein will always be the best. Grain-Free Formula – Whole grains have their own health benefits, but not all dogs can benefit from eating such. Just like humans, dogs differ in ways plenty. So if your dog is allergic to grains such as rice or wheat, make sure he eats a grain-free formula. Taste and Quality – Just because it's cheap, it doesn't mean it has to be bland. You don't have to compromise its taste and quality just because you opt for something more affordable. But beware of artificial colors and flavors. Dog food made with real, fresh ingredients taste great even without additives. Age-Appropriate Formula – Don't give a Pomeranian dog food that is formulated for a Great Dane or a senior dog's diet to a puppy and vice versa. Every life stage has varying nutrition requirements and you must adhere to it if you want the best for your dog. Blue Buffalo Life Protection is a high-quality dog food proudly made in the USA. Its formula is specially calibrated to cater the needs of our dogs who are at the adult stage of their life. It features a right balance of essential nutrients that our canine companions require to achieve optimal health. Blue Buffalo Life Protection is made with wholesome ingredients that even the pickiest eater will love! You can rest assured that there will be no problems getting Doggo to eat his ration. The delicious protein-rich chicken helps maintain strong, lean muscles. Combined with whole ground brown rice, your dog gets a tasty, balanced meal! Ground brown is 85% carbohydrates and hence ensures Doggo has the energy he needs for his daily adventures. Likewise, brown rice is a good source of fiber for good digestion as well as B vitamins. In addition, Blue Buffalo Life Protection is fortified with antioxidants to boost your dog's immune system and Omega-fatty acids for a better-looking skin and coat. 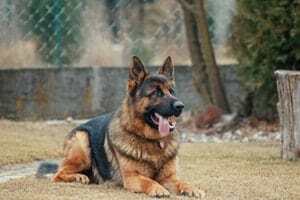 Big or small, the Blue Buffalo Life Protection should be an excellent choice for your furry housemates especially if you are looking for a high-quality dog food at a reasonable price. It is intuitive that a Chihuahua tends to have radically different needs compared to a German Shepherd. For one, small dogs have tinier stomachs and quicker metabolism rates. Blue Buffalo Life Protection for small breeds provides a macro-nutrient balance needed for the health and well-being of our smaller fur-kids. Your tiny terrier may be high-spirited, but he has less stamina since he can't store a lot of energy compared to his larger brothers and hence, small breeds require a diet that is high in protein and carbohydrates. A bowl of Blue Buffalo Life Protection provides just that! Blue Buffalo Life Protection's formula uses high-quality deboned chicken as its source of protein, keeping your dog's swift little legs lean and strong. Mixed with brown rice, barley, and potatoes, your small breed can get a fairly high level of carbohydrates to keep him up and running. However, this is not a good choice if your dog is obese or inactive. It is also important to note that there is no egg, dairy, or beef in this recipe just in case your dog is allergic to those ingredients. Moreover, this dog food is fortified with antioxidants and chelated minerals to boost Doggo's first line of defense against common illnesses. A nutritious, balanced diet consisting a wealth of vitamins and minerals is critical for our growing puppies. Hill's Science Diet guarantees your large yet little pup has the nourishment he needs for the development of his teeth and bones, good eyesight, a strong physique and immune system among many others. Its key ingredient is chicken meal paired with whole grains for that perfect protein and carbohydrate combination. Take note that it's merely a misconception that chicken meal consists of feathers, feet, and intestines. Chicken meal is, in fact, a much better source of protein compared to fresh chicken. It is a rendered form of the said meat and since moisture has been extracted out, it provides you a more concentrated level of protein. Moreover, adding oats to your puppy's diet provides a list of health benefits. Oats are a good source of carbohydrates and soluble fiber, which helps promote bowel regularity. Likewise, it contains linoleic acid that promotes healthy skin and coat. If little Doggo is allergic to wheat, know that oats are a great alternative. Pork fat and fish oil are also added as minor components in this dog food's formula, but only to increase little Doggo's appetite so he can munch on his food with delight. After all, he needs to gain some weight! Formulated with optimum calcium requirement for pups up to 1 yr.
Day in day out, more and more fur-parents are switching to grain-free dog food such as the Whole Earth Farms Grain-Free Recipe. Why would they choose such brand? First of all, thousands of satisfied fur-parents have testified how their dogs love its chicken and turkey combo. Chicken and its brother fowl, turkey are good sources of protein and amino acids to help build strong muscles and repair joints. Both meat sources also provide selenium and antioxidants that boost the immune system and combat free radical damage. Such meat types are nourishing and filling but less fattening, which makes them ideal for weight management. Apart from free-range chicken and turkey, fresh vegetables are also added to the mix. Whole Earth Farms is grain-free, yes, but it does contain carbohydrates in the form sweet potatoes. Sweet potatoes provide 92% carbohydrates, and hence transitions your little fur-ball into a ball of fire so he can run and play during the day. Unless your dog is diabetic, sweet potatoes should be the least of your concern. Moreover, potatoes are an excellent source of fiber to promote digestion and bowel regularity. With dogs in mind, TV personality and celebrity chef, Racheal Ray collaborated with Ainsworth Pet Nutrition to create a line of mouth-watering dog foods that will not only satisfy our furry companions' discerning taste buds and hungry stomachs but will also nourish them to optimum health! Among these products is the Rachael Ray Nutrish Zero Grain Natural dog food. This product uses fresh real salmon as its primary ingredient and protein source; thus, it is well-suited for dogs who are allergic to more common meat ingredients such as chicken meal, chicken, and turkey. Apart from protein, salmon is rich in Omega-fatty acids that promote heart health, cognitive function, and mobility. After weeks of consumption, you can tell that your dog is much healthier as his coat becomes shinier and produces less hair shedding. Rachael Ray Nutrish Zero Grain Natural promises that this dog food contains no by-products, cheap fillers, gluten, preservatives, artificial flavors, and colors. Fortified with natural prebiotics and fiber from sweet potatoes, this dog food promotes digestion and prevents GI issues in sensitive dogs. Although grain-free, take note that sweet potatoes alone are rich in carbohydrates and will keep your dog as alert as he can be! As its name suggests, this dog food will certainly give your beast-friend a pleasurable time enjoying a taste of the wild. Dogs are not obligatory carnivores, but they need all the protein they can get! The Taste of the Wild High Prairie Dog Food exhibits a special double-protein diet, making most of venison and bison meats' rich, vivid flavors and high protein content. This wolf-like diet is specially intended to satisfy your dog's needs. Domesticated as they are, dogs are still wolves' descendants and thus share almost the same DNA. They need their protein from real meat sources, not plants. Moreover, Taste of the Wild High Prairie contains no chicken or eggs that may trigger allergies in some dogs. It is a zero-grain recipe, making it perfect for the ferocious eater with a sensitive stomach. Although it's grain-free, fiber-rich sweet potatoes provide the carbohydrates to keep your dog bright-eyed and bushy-tailed. Sweet potatoes also contain fiber needed for proper digestion. In addition, a mix of berries and vegetables are added to ensure maximum health benefits. Dogs thrive best with a high-protein diet but most of the time they are picky eaters, so sometimes even a well seasoned chicken drumstick will be ignored. One way to solve this problem and make him receive his daily dose of essential nutrients is by feeding him Merrick Grain-Free Buffalo & Sweet Potato dry dog food. Just one sniff and your dog can tell it's good! The Merrick Grain-Free formula uses real buffalo meat as its primary ingredient. Take note that this product is a single-source protein diet and does not contain meat by-products that may trigger allergies. To make it more palatable and digestible, a variety of fruits such as apples and blueberries are added into its recipe. Hence, this dog food features an array of vitamins and minerals for a complete and balanced nutrition. Its grain-free recipe uses sweet potatoes as the main source of carbohydrates. Sweet potatoes are also a good source of fiber. This dog food also promotes your dog's skin and coat with its right balance of Omega-3 and Omega-6 fatty acids. Merrick Grain-Free Buffalo & Sweet Potato will make the itchiness and redness go away! It is our mission to help you find the best cheap dog foods. After all, we are your fellow fur-parents and we understand that dogs aren't just pets but family members. We promise that these seven inexpensive healthy dog food brands will give your pooch the taste and quality that he deserves while keeping your wallet intact. Among our choices, we highly recommend the Blue Life Protection for your adult dog. Loaded with vitamins and minerals, a bowl of this dog food ensures that Doggo receives a complete and balanced meal every day. As for the tiny furry housemate with a big personality, it would be best to opt for the Blue Life Protection formulated for small breeds. Both products coming from the same brand have garnered thousands of positive reviews from happy households. And your family could be the next!